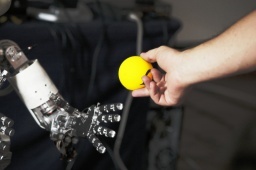 The Human ability to cooperate defines one of the ultimate goals for robot cognition. Human cognitive development lays out a well documented series of milestones for achieving that goal. The objective of the workshop is to provide concrete illustrations of how data from human developmental psychology has/can influenced robot cognitive systems to foster cooperation with humans. A corresponding objective is to begin to bring these two research communities together in a cooperative dialog. Presentations should ideally include concrete cases of developmental psychology or human cognitive science being applied to (or posing well characterized challenges to) robotics. Our workshop (Workshop 1) and Workshop 4 share common interests, and we thus decided to have a common component in the morning with talks from both workshops. In the afternoon the two groups will break-up into their specific sessionns. We trust that this integrative effort will have a strong synergistic effect! The afternoon session will include two invited talks (45 minutes), and then a focused discussion concerning (1) what are the developmental cognitive phenomena that we are currently not addressing in cognitive robotics, and (2) what is the roadmap for addressing these issues? Please feel free to send me alternate topics of discussion. Tuning and signaling: lessons for human and robot learning from the Speechome Project. Tuning and signaling: lessons for human and robot learning from the Speechome Project. Brandon Roy (MIT) Naturalistic longitudinal recordings of child development promise to offer new opportunities and perspectives for researchers in cognitive science and robotics alike. In this talk, I present our work exploring early language development by “stepping into the shoes” of a child as part of the Human Speechome Project. Toward this end, the home of a young child was outfitted with a custom audio-video recording system to unobtrusively capture roughly 80% of the child’s waking life, from birth to age three. With a corpus of more than 230,000 hours of audio-video recordings, we have developed new tools and methods of analysis. Our current work focuses on the relation between caregiver speech and early word learning, showing the child to be sensitive to both frequency and prosodic cues in the input. Similarly, the caregivers show a surprising sensitivity to the child’s linguistic abilities and tune their behavior accordingly. Preliminary observations of gestural, situational and other signals further suggest that the caregiver-child dyad is a well-tuned system, enabling communication and creating learning opportunities. We believe the natural structure of the child’s learning environment should prove fertile ground for developmental robotics. However, in online learning a key challenge for robotics will be engaging with the human in a similar interactive, tuned-in manner. I will present an overview of the Speechome Project, our techniques for large-scale annotation and analysis of audio and video, and some initial results. 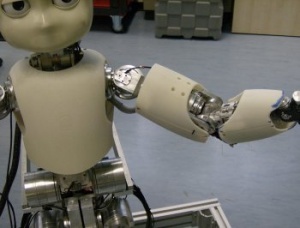 Children and adults with sensorimotor disabilities can significantly increase their autonomy through the use of assistive robots. As the field progresses from short-term, task-specific solutions to long-term, adaptive ones, new challenges are emerging. In this talk a lifelong methodological approach is presented, that attempts to balance the immediate context-specific needs of the user, with the long-term effects that the robot¹s assistance can potentially have on the user’s developmental trajectory. Those working in robot cognitive systems, as well as robot planning and HRI. Cognitive scientists and developmental psychologists to see how work from their field can interact with and be tested by robot implementation. This page was last edited on 3 December 2009, at 12:56.